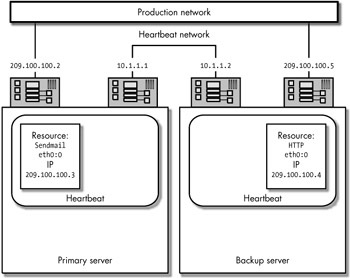 This chapter describes how to use the high-availability resources file, haresources, to control resources on a pair of servers running Heartbeat. We will also explore some of the common maintenance tasks required to keep the Heartbeat high-availability system functioning properly. The /etc/ha.d/haresources file must be the same on both the primary and the backup Heartbeat servers. The name of the server where the resource should normally run (the primary server), followed by a space or tab. A resource script (the script used to start and stop the resource) located in either the /etc/init.d or the /etc/ha.d/resource.d directory. If arguments need to be passed to the resource script, they are added after two colons and are separated from each other by two colons. Additional resource scripts can be added to the line using the space character as a separator. If you need to create a haresources line that is longer than the line of text that fits on your screen, you can add the backslash character (\) to indicate that the haresources entry continues on the next line. Let's examine each element of the haresources file in more detail. The primary-server name you enter at the start of the haresources line should match one of the server names you've already specified in the /etc/ha.d/ha.cf file. It should also match the name returned by the uname -n command on the primary server. Heartbeat will add 209.100.100.3 as an IP alias to one of the existing NICs connected to the system and send Gratuitous ARP broadcasts out of this NIC to the locally connected computers when it first starts up. It will only do this on the backup server if the primary server goes down. You cannot place the primary IP address for the interface in the haresources file. Heartbeat can add an IP alias to an existing interface, but it cannot be used to bring up the primary IP address on an interface. The output of this command is based on entries the kernel stores in the /proc/net/route file that is created each time the system boots using the route commands in the /etc/init.d/network script on a Red Hat system. See Chapter 2 for an introduction to the kernel network routing table. The IPaddr script has executed the command route add -host 209.100.100.3dev eth1. Finally, to complete the process of adding the IP alias to the system, the IPaddr script sends out five gratuitous ARP broadcasts to inform locally connected computers that this IP alias is now associated with this interface. If more than one entry in the routing table matched the IP alias being added, the findif program will use the metric entry in the routing table to select the interface with the fewest hops (the lowest metric). To compare the network portion of the IP alias to the network portion of the "destination" address entry in the routing table, findif needs to know which portion of the address represents a network and which portion represents a node. In other words, it needs to know which network mask to apply to both the destination address in the routing table and the IP alias from the haresources file before it can determine whether the network portions of the two addresses match. The findif program will use the network mask for each entry in the routing table and apply it to both the routing table entry and the IP alias being requested to see if they match. If the two network portions of the addresses match, they are on the same network, and findif knows to add the IP alias being requested to the interface associated with this routing table entry. says that Heartbeat should use a network mask of 255.255.255.0. It also says that if no other entry in the routing table with its associated network mask applied to it matches this address, the default route in the routing table should be used. This entry matches the 209.100.100.3 IP alias once the 255.255.255.0 netmask from this routing table entry is applied to both addresses for the comparison (both addresses are on the 209.100.100 network). So the correct interface (eth1 in this case) is selected even though the default route was not used in the interface selection process. Thus, in this example, the IP alias is 209.100.100.3 with a 24-bit netmask (equivalent to a network mask of 255.255.255.0) on network interface card eth0, using a broadcast address of 209.100.100.255. With this entry in the haresources file, Heartbeat will always use the eth0 interface for the 209.100.100.3 IP alias when adding it to the system for the httpd daemon to use. If you need to modify the routing table as part of the process of taking over an IP address, then you may want to use the iptakeover script described in Chapter 7 to perform Gratuitous ARP broadcasts yourself. To use this script, add a line like the following to the haresources file. Heartbeat will then run /etc/ha.d/resource.d/iptakeover status followed by /etc/ha.d/resource.d/myresource start. This makes it possible for you to decide exactly which interface you want your IP alias to appear on, to modify the routing table if need be, and to perform the Gratuitous ARP broadcasts from a single script. However, under most circumstances this is not required and should be avoided if possible—specify an IP address in the haresources file and let Heartbeat do all of this work for you. Assuming you add this line to the haresources file on both the primary and the backup server, Heartbeat will run /etc/ha.d/resource.d/myresource FILE1 start when it first starts on the primary server, and then again on the backup server when the primary server fails. When the resource needs to be "released" or stopped, Heartbeat will run the script with the command /etc/ ha.d/resource.d/myresource FILE1 stop. The haresources syntax is also documented online at http://wiki.trick.ca/linuxha/ HeartbeatResourceAgent. Until now, we have only described resources as independent entries in the haresources file. In fact, Heartbeat considers all the resources specified on a single line as one resource group. When Heartbeat wants to know if a resource group is running, it asks only the first resource specified on the line. Multiple resource groups can be added by adding additional lines to the haresources file. In this book, we are only concerned with Heartbeat's ability to failover a resource from a primary server to a backup server. Recall from Chapter 6 that this is the system init directory (/etc/init.d, /etc/rc.d/init.d/, /sbin/ init.d, /usr/local/etc/rc.d or /etc/rc.d) and the Heartbeat resource directory (/etc/ha.d/resource.d). IP aliases were introduced in Chapter 6. GARP broadcasts were also introduced in Chapter 6. See "Routing Packets with the Linux Kernel" in Chapter 2. Note that the resource daemon (httpd in this case) may also need to be configured to use this interface or this IP address as well. Also, as we'll see in Part III, you'll want to leave IP alias assignment under Heartbeat's control so Ldirectord can failover to the backup load balancer. This assumes the script myresource is located in the /etc/ha.d/resource.d directory and not in the /etc/init.d directory—in which case the command would be /etc/rc.d/resource.d FILE1 start. Using Heartbeat and two computers, we can offer one daemon, or service, from the primary server and then offer a different service from the backup server. If either server fails, the other one will start offering both services. This is a form of load sharing called an active-active server configuration, but to use it you will have to ensure that each system has the processing power and ability to handle the network load that will allow it to offer both services in the event of a failure. This configuration, however, is much more difficult to administer and support in a production environment. Neither server can go down for maintenance or upgrades without causing a failover of at least one service. Figure 8-1 shows a sample diagram of this type of Heartbeat configuration. Once Heartbeat is running on both servers, the primary.mydomain.com computer will offer sendmail at IP address 209.100.100.3, and the backup. mydomain.com computer will offer httpd at IP address 209.100.100.4. If the backup server fails, the primary server will perform Gratuitous ARP broadcasts for the IP address 209.100.100.4 and run httpd with the start argument. (The names "primary" and "backup" are really meaningless in this configuration because both computers are acting as both a primary and a backup server.) Client computers would always look for the sendmail resource at 209.100.100.3 and the http resource at 209.100.100.4, and even if one of these servers went down, the resource would still be available once Heartbeat started the resource and moved the IP alias over to the other computer. This configuration is more difficult to administer than an active-standby configuration, because you will always be making changes on a "live" system unless you failover all resources so they run on a single server before you do your maintenance. This configuration is also not recommended when using local data (data stored on a locally attached disk drive of either server) because complex data replication and synchronization methods must be used. But what if you wanted to offer just one resource from both computers and have them share the work? This is the goal of the cluster described in this book, and it will be possible to attain that goal using load balancing software described in Part III. However, for now we can achieve a simple form of load balancing using round-robin DNS. When using round-robin DNS, the two servers would, in theory, each get half of the client requests, and Heartbeat would ensure that both IP addresses are available even if one of the servers goes down. Most client computers, however, have a name services caching daemon or NSCD that will cause them to remember (at least for a while) an IP address once they learn it. Storing this IP address on the client computer reduces the need for the client computer to repeatedly ask, "What is the IP address for this host name?" and helps improve the chances that client computers will not enter into a dialog (such as an HTTPS secure transaction) with one web server only to end up improperly sending a response (such as a credit card number) to another web server. Caching IP address-to-host name can cause a cache-only DNS server on the Internet to respond to client requests for an IP address with a nonauthoritative reply using only one of the IP addresses. This intervening, cache-only DNS server effectively blocks the round-robin DNS replies from your authoritative DNS server. You can try to stop this behavior by setting a very low time to live (TTL) value for your DNS replies. Once the amount of time specified in your time to live entry elapses, the intervening DNS server should drop the IP address-to-host name mapping it has stored in its memory and ask your authoritative DNS server once again for the proper IP address. Using round-robin DNS and this type of heartbeat configuration for load sharing, however, lets you locate your two servers at two different physical locations. In the event of a true disaster, one of the servers would be able to take over both (or all) IP addresses, and once the routers on the Internet figured out where the IP address had moved to, eventually allow the client computers to continue to connect to your web server at its new location. This configuration is very susceptible to a split-brain condition. If exclusive access to resources is required, automatic failover mechanisms that require heartbeats to traverse a WAN or a public network should not be used. Now, what if the client computer on the Internet is much closer to one of the two web servers offering the same web page and it accidentally ends up with the IP address that happens to be on a server located on the other side of the world? It would make sense to offer your resources from the servers closest to the Internet client and only force the client to route to another server in the event of a failure or system crash. See Chapter 7, "Failover Configurations and Issues," in Blueprints for High Availability by Evan Marcus and Hal Stern. To prevent this problem from ever happening, many DNS clients and servers ignore small TTL values and use cached information anyway. This entry says that the host named primarynode should normally "own" the resource AudibleAlarm, but that the AudibleAlarm should never sound on the primary server. The AudibleAlarm resource, or script, allows you to specify a list of host names that should never sound an alarm. In this case, we are telling the AudibleAlarm script not to run or sound on the primarynode. When a failover occurs, Heartbeat running on the backup server will sound the alarm (an audible beep every one second). These haresources entries rely on the scripts /etc/ha.d/resource.d/AudibleAlarm and / etc/ha.d/resource.d/MailTo. These scripts are located in the chapter8 subdirectory on the CD-ROM. You can also download them from the Linux-ha CVS repository (see the heartbeat/resource.d directory for additional scripts). The AudibleAlarm script can also be modified to flash the floppy drive light if you have installed the fdutils packages. The fdutils package contains a utility called floppycontrol. You can easily download and compile the fdutils package (download the tar file from http://fdutils.linux.lu, then run ./configure, then make) and uncomment the lines in the /etc/ha.d/ resource.d/AudibleAlarm script to make the floppy drive light flash. Thanks to the fact that Heartbeat resource scripts are called by the heartbeat daemon with start, stop, or status requests, you can restart a resource without causing a cluster transition event. For example, say your Apache web server daemon is running on the primary.mydomain.com web server, and the backup.mydomain.com server is not running anything; it is waiting to offer the web server resource in the event of a failure of the primary computer. If you needed to make a change to your httpd.conf file (on both servers!) and you wanted to stop and restart the Apache daemon on the primary computer, you would not want this to cause Heartbeat to start offering the service on the backup computer. Fortunately, you can run the /etc/init.d/httpd restart command (or /etc/init.d/httpd stop followed by the /etc/init.d/httpd start command) without causing any change to the cluster status as far as Heartbeat is concerned. Thus, you can safely stop and restart all of the cluster resources Heartbeat has been asked to manage, with perhaps the exception of filesystems, without causing any change in resource ownership or causing a cluster transition event. Of course, many daemons will also recognize the SIGHUP (or kill -HUP <process-ID-number>) command as well, so you can force a resource daemon to reload its configuration files after making a change without stopping and restarting it. The file containing the httpd parent process ID number is controlled by the PidFile entry in the httpd.conf file (this file is located in the /etc/httpd/conf directory on Red Hat Linux systems). If you need to make a change to the heartbeat configuration file /etc/ha.d/ authkeys, or /etc/ha.d/ha.cf, you can force the running heartbeat daemon to reload these configuration files with the following command. When you change a haresources file, you need to restart Heartbeat on both the primary and the backup server to make your changes take effect (the reload option will not work). Normally, when the primary server crashes and the backup server takes ownership of a resource, the backup server will only hold this resource until the primary server comes back up. Once the primary server is up and running again, the backup server will release the resource and the primary server will assume ownership once again; it will start the resource script and start offering the service to client computers. This is the default heartbeat failback configuration. heartbeat: info: nice_failback is in effect. This configuration is useful when you want to perform system maintenance tasks that require you to reboot the primary server. When you take down the primary server and the resources are moved to the backup server, they will not automatically move back to the primary server. Once you are happy with your changes and want to move the resource back to the primary server, you would remove the nice_failback option from the ha.cf file and again run the following command on the backup server. If you want auto_failback turned off as the default, or normal, behavior of your Heartbeat configuration, be sure to place the auto_failback option in the ha.cf file on both servers. If you neglect to do so, you may end up with a split-brain condition; both servers will think they should own the cluster resources. The setting you use for the auto_failback (or the deprecated nice_failback) option has subtle ramifications and will be discussed in more detail in Chapter 9. The primary server will not go into standby mode if it cannot talk to the heartbeat daemon on the backup server. In Heartbeat versions through 1.1.2, the hb_standby command required nice_failback to be turned on. With the change in syntax from nice_failback to auto_failback , Heartbeat no longer requires auto_failback to be turned off. However, if you are using an older version of Heartbeat that still supports nice_failback, it must still be turned on to use the hb_standby command. In this example, the primary server (where we ran the hb_standby command) is requesting that the backup server take over the resources. When the backup server receives this request, it asks the primary server to release its resources. If the primary server does not release the resources, the backup server will not start them. The hb_standby command allows you to specify an argument of local, foreign, or all to specify which resources should go into standby (or failover to the backup server). Sometimes Heartbeat will report that it cannot hear its own heartbeat, or that heartbeat times are too long. If the heartbeat logs indicate that a heartbeat was not received within the deadtime timeout period and the backup server tried to take over for the primary server when you did not want it to, you need to properly tune your deadtime value to account for system and network environmental conditions that may be causing heartbeats to get lost or to not be heard. This can occur on systems that are heavily loaded with network processing tasks, or even with heavy CPU utilization. To tune the heartbeat deadtime value for these conditions, set the deadtime value to a large value such as 60 seconds or higher, and set the warntime value to the number of seconds you would like to use for your deadtime value. Now run the system for a few weeks and carefully watch the /var/log/ messages file and the logfile /var/log/ha-log for warntime messages indicating the longest period of time your system went without hearing a heartbeat. Armed with that information, set your warntime to this amount, and multiply this warntime value by 1.5 to 2 to arrive at the smallest possible value you should use for your deadtime. Leave logging enabled and continue to monitor your logs to make sure you have not set the value too low. These messages will appear every 24 hours, beginning when Heartbeat was started. After a few days of operation, the total number of bytes used should not grow. These informational messages from Heartbeat can be ignored when Heartbeat is operating normally. On a normal Unix/Linux server, the init daemon will start daemons (usually serial line communication services or tty related services) based on entries in the /etc/inittab file. If the entry contains the word respawn, init will monitor the daemon and restart it if it dies for any reason. If the application should run on both the primary and the backup server all of the time, create an entry for the application in /etc/inittab (see the man page for inittab for syntax details). This line tells Heartbeat to run the /usr/sbin/faxgetty program and pass it the argument ttyQ01e0. Heartbeat will do this when it first starts up on both the primary and the backup Heartbeat servers (recall that the Heartbeat configuration files should always be the same on both servers). A license manager daemon such as lmgrd from GlobeTrotter Software can be configured to failover in conjunction with an IP address, just like any other daemon. However, before you can use a license manager, you will need a second set of licenses from your software vendor for the backup server's hostid. Some software vendors will allow you to have two sets of licenses if you agree to use the second set only when the primary license server goes down. There is a 20-minute timeout period (it was a 10-second timeout period prior to version 1.0.2). To make a resource highly available, you need to eliminate single points of failure and understand how to properly administer a highly available server pair. To administer a highly available server pair, you need to know how to failover a resource from the primary server to the backup server manually so that you can do maintenance tasks on the primary server without affecting the resource's availability. Once you know how to failover a resource manually, you can place it under Heartbeat's control by creating the proper entry or entries in the haresources file to automate the failover process. Recall from Chapter 6 that a split-brain condition occurs when more than one server thinks it has exclusive ownership of a resource. The consequences of a split-brain condition can include the inability to answer client computer requests for service, or perhaps even worse, the ability to answer requests inaccurately. For example, if two servers have the ability to offer client computers access to a warehouse inventory database that is stored locally on each server's disk drive in a high-availability configuration, only one server should be able to modify the database at a time. If each server allows users to modify its copy of the inventory database, then neither database will be accurate, and correcting the errors in the data will be difficult, if not impossible. The situation is even worse if both servers share access to a single disk drive (using a shared SCSI bus, for example). In the scenario just described, the local copy of the database will be out of date on both servers, but if a split-brain condition occurs when the primary and backup server both try to write to the same database (stored on the shared disk drive), the entire database may become corrupted. This chapter explains how to avoid a split-brain condition using a component in the Heartbeat package called Stonith. We'll discuss how to use a feature of Heartbeat called ipfail, which allows Heartbeat servers to detect which server should own the resources based on the Heartbeat servers' ability to communicate on the network. We'll also show you how to use the kernel capability called Watchdog, which allows the system to reboot itself if the Heartbeat program hangs, and we'll conclude with the basic tests you should perform on your high-availability servers before they go into production. Stonith, or "shoot the other node in the head," is a component of the Heartbeat package that allows the system to automatically reset the power of a failing server using a remote or "smart" power device connected to a healthy server. A Stonith device is a device that can turn power off and on in response to software commands. A serial or network cable allows a server running Heartbeat to send commands to this device, which controls the electrical power supply to the other server in a high-availability pair of servers. The primary server, in other words, can reset the power to the backup server, and the backup server can reset the power to the primary server. Although there is no theoretical limitation on the number of servers that can be connected to a remote or "smart" power device capable of cycling system power, the majority of Stonith implementations use only two servers. Because a two-server Stonith configuration is the simplest and easiest to understand, it is likely in the long run to contribute to—rather than detract from—system reliability and high availability. This section will describe how to get started with Stonith using a two-server (primary and backup server) configuration with Heartbeat. When the backup server in this two-server configuration no longer hears the heartbeat of the primary server, it will power cycle the primary server before taking ownership of the resources. There is no need to configure sophisticated cluster quorum election algorithms in this simple two-server configuration; the backup server can be sure it will be the exclusive owner of the resource while the primary server is booting. If the primary server cannot boot and reclaim its resources, the backup server will continue to maintain ownership of them indefinitely. The backup server may also keep control of the resources if you enable the auto_failback option in the Heartbeat ha.cf configuration file (as discussed in Chapter 8). Forcing the primary server to reboot with a power reset is the crudest and surest way to avoid a split-brain condition. As mentioned in Chapter 6, a split-brain condition can have dire consequences when two servers share access to an external storage device such as a single SCSI bus connection to one disk drive. If the server with write permission, the primary server, mal-functions, the backup server must take great precautions to ensure that it will have exclusive access to the storage device before it modifies data. Stonith also ensures that the primary server is not trying to claim ownership of an IP address after it fails over to a backup server. This is more important than it sounds, because many times a failover can occur when the primary server is simply not behaving properly and the lower-level networking protocols that allow the primary server to respond to ARP requests ("Who owns this IP address?") are still working. The backup server has no reliable way of knowing that the primary server is engaging in this sort of improper behavior once communication with the daemons on the primary server, especially with the Heartbeat daemon, is lost. Other high-availability solutions sometimes call this Stomith, or "shoot the other machine in the head." "Complexity is the enemy of reliability," writes Alan Robertson, the lead Heartbeat developer. With three or more servers competing for cluster resources, a quorum, or majority-wins, election process is possible (quorum election will be included in Release 2 of Heartbeat). More sophisticated methods are possible through advanced SCSI commands, which are not implemented in all SCSI devices and are not currently a part of Heartbeat. All resources must run on the primary server (no resources are allowed on the backup server as long as the primary server is up). A failover event can only occur one time and in one direction. In other words, the resources running on the primary server can only failover to the backup server once. When the backup server takes ownership of the resources, the primary server is shut down, and operator intervention is required to restore the primary server to normal operation. 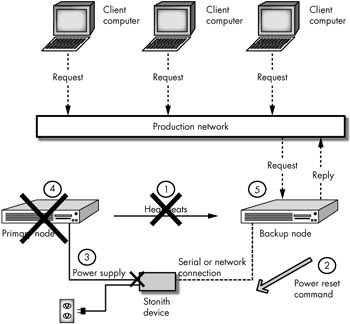 When you use only one Stonith device, you must run all of the highly available resources on the primary server, because the primary server will not be able to reset the power to the backup server (the primary server needs to reset the power to the backup server when the primary server wants to take back ownership of its resources after it has recovered from a crash). Resources running on the backup server, in other words, are not highly available without a second Stonith device. Operator intervention is also required after a failover event when you use only one Stonith device, because the primary server will go down and stay down—you will no longer have a highly available server pair. With a clear understanding of these two limitations, we can continue our discussion of Heartbeat and Stonith using a sample configuration that only uses one Stonith device. 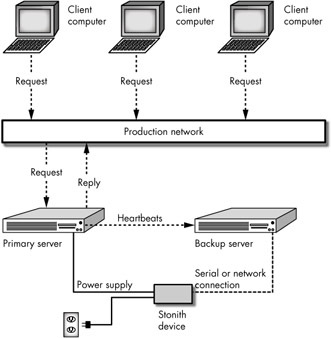 Figure 9-1 shows a two-server, high-availability configuration using Heartbeat and a single Stonith device with three client computers connecting to resources on the primary server. Normally, the primary server broadcasts its heartbeats and the backup server hears them and knows that all is well. But when the backup server no longer hears heartbeats coming from the primary server, it sends the proper software commands to the Stonith device to cycle the power on the primary server, as shown in Figure 9-2. The Stonith event begins when heartbeats are no longer heard on the backup server. This does not necessarily mean that the primary server is not sending them. The heartbeats may fail to reach the backup server for a variety of reasons. This is why at least two physical paths for heartbeats are recommended in order to avoid false positives. The backup server issues a Stonith reset command to the Stonith device. The Stonith device turns off the power supply to the primary server and then turns it back on. As soon as the power is cut off from the primary server, it is no longer able to access cluster resources and is no longer able to offer resources to client computers over the network. This guarantees that client computers are unable to access the resources on the primary server and eliminates the possibility of a split-brain condition. The backup server then acquires the primary server's resources. Heartbeat runs the proper resource script(s) with the start argument and performs gratuitous ARP broadcasts so that client computers will begin sending their requests to its network interface card. Once the primary server finishes rebooting it will attempt to reclaim ownership of its resources again by asking the backup server to relinquish them, unless both servers have the auto_failback turned off. Client computers should always access cluster resources on an IP address that is under Heartbeat's control. This should be an IP alias and not an IP address that is automatically added to the system at boot time. [a]Comments in the code state that no configuration file is used with this device. Apparently it will always use the /dev/ups device name to send commands, so you need to create a link to /dev/ups from the proper /dev/tty device. [b]The code implies other RPC devices should work as well. Operator alert; this tells a human being to do the power reset. It is used in conjunction with the meatclient program. Usually used only for testing. This causes Stonith to attempt to use the secure shell SSH [a] to connect to the failing server and perform a reboot command. [a]See Chapter 5 for a description of how to set up and configure SSH between cluster, or Heartbeat, servers. You may also still see a null device. This "device" was originally used by the Heartbeat developers for coding purposes before the SSH device was developed. This command tells Stonith to create a device of type (-t) meatware with no parameters (-p "") for host chilly. STONITH: OPERATOR INTERVENTION REQUIRED to reset test. STONITH: Run "meatclient -c test" AFTER power-cycling the machine. migrated services might not work as expected. Because meatware is an operator alert message sent to the /var/log/messages file and not a real device we do not need to worry about any additional cabling and can safely assume that both the primary and backup servers will have "access" to this Stonith "device." They need only be able to send messages to their log files. When following this recipe, be sure that the auto_failback option is turned on in your ha.cf file. With Heartbeat version 1.1.2, the auto_failback option can be set to either on or off and ipfail will work. Prior to version 1.1.2 (when nice_failback changed to auto_failback), the nice_failback option had to be set to on for ipfail to work. The second line says that the primary server should normally own the sendmail resource (it should run the sendmail daemon). The examples above and below use the name of the server followed by the > character to indicate a shell prompt on either the primary or the backup Heartbeat server. Stopping Heartbeat on the primary server using the Heartbeat init script (service heartbeat stop) will cause Heartbeat to release its resources. Thus the backup server will not need to reset the power of the primary server. To test a Stonith device, you'll need to kill Heartbeat on the primary server without allowing it to release its resources. You can also test the operation of your Stonith configuration by disconnecting all physical paths for heartbeats between the servers. backupserver heartbeat: info: Link backupserver:eth0 up. backupserver heartbeat: info: Resource acquisition completed. Notice that Heartbeat did not start the sendmail resource; it is waiting for you to clear the Stonith Meatware event. backupserver heartbeat: server primaryserver Meatware-reset. backupserver heartbeat: info: server primaryserver now reset. Heartbeat on the backup server is now satisfied: it owns the primary server's resources and will listen for Heartbeats to find out if the primary server is revived. Notice in this example how you will have a much easier time performing system maintenance when you place all of your resources on a primary server and leave the backup server idle. However, you may want to place active services on both the primary and backup Heartbeat server and use the hb_standby command to failover resources when you need to do maintenance on one or the other server. STONITH: Invalid config file for rps10 device. All tokens are white-space delimited. This line tells Heartbeat that the backup server controls the power supply to the primary server using the serial cable connected to the /dev/ttyS0 port on the backup server, and the primary server's power cable is plugged in to outlet 0 on the rps10 device. For Stonith devices that connect to the network you will also need to specify a login and password to gain access to the Stonith device over the network before Heartbeat can issue the power reset command(s). If you use this type of Stonith device, however, be sure to carefully consider the security risk of potentially allowing a remote attacker to reset the power to your server, and be sure to secure the ha.cf file so that only the root account can access it. One potential advantage of offering all of the resoures from the primary server and not running any resources on the backup server (which you will recall is a limitation of the single-Stonith configuration I have been describing in this chapter) is that you can simply power off the primary server when the backup server takes ownership of the resources. This prevents the situation where confused Heartbeat servers start reseting each other's power and resources move back and forth between the primary and backup server. This allows you to power off rather than power reset any Stonith device that supports it. Formerly (prior to version 1.1.2) the nice_failback option turned on. Even with these preparations, we still have not eliminated all single points of failure in our two-server Heartbeat failover design. For example, what happens if the primary server simply loses the ability to communicate properly with the client computers over the normal, or production network? In such a case, if you have a properly configured Heartbeat configuration the heartbeats will continue to travel to the backup server. This is thanks to the redundancy you built into your Heartbeat paths (as described in Chapter 8), and no failover will occur. Still, the client computers will no longer be able to access the resource daemons on the primary server (the cluster resources). Use the ipfail API plug-in, which allows you to specify one or more ping servers in the Heartbeat configuration file. If the primary server suddenly fails to see one of the ping servers, it asks the backup server, "Did you see that ping server go down too?" If the backup server can still talk to the ping server, it knows that the primary server is not communicating on the network properly and it should now take ownership of the resources. If you are using a version of Heartbeat prior to version 1.1.2, you must turn nice_failback on. Version 1.1.2 and later allow auto_failback (the replacement for nice_failback but with the opposite meaning) to be either on or off. Now start Heartbeat on both servers and test your configuration. You should see a message in /var/log/messages indicating that Heartbeat started the ipfail child client process. Try removing the network cable on the primary server to break the primary server's ability to ping one of the ping servers, and watch as ipfail forces the primary server into standby mode. The backup server should then take over the resources listed in haresources. The /etc/ha.d/ha.cf configuration file should be the same on the primary and backup server. And, of course, be sure to configure your iptables or ipchains rules to accept ICMP traffic (see Chapter 2). 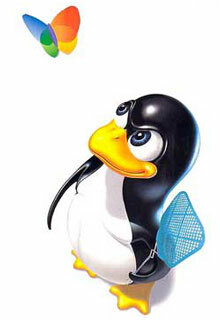 The kernel has its own method to handle a hung system, called watchdog. Watchdog is simply a kernel module that checks a timer to make sure the system is healthy. If watchdog thinks the kernel is hung, it can take drastic action such as a system reboot. If you want to protect your high-availability server configuration from a server hang that causes an interruption in services even when the server hang is not detected by Heartbeat, you should enable watchdog in your kernel. We are talking about a server hang here and not an application problem. Heartbeat (prior to Heartbeat release 2, which is not yet available as of this writing) does not monitor resources or the applications under its control to see if they are healthy—to do this you need to use another package such as the Mon monitoring system discussed in Part IV. A watchdog device is normally connected to a system to allow the kernel to determine whether the system has hung (when the kernel no longer sees the external timer device updating properly, it knows that something has gone wrong). The watchdog code also supports a software replacement for external hardware timers called softdog. Softdog maintains an internal timer that is updated as soon as another process on the system writes to the /dev/watchdog device file. If softdog doesn't see a process write to the /dev/watchdog file, it assumes that the kernel must be malfunctioning, and it will initiate a kernel panic. Normally a kernel panic will cause a system to shut down, but you can modify this default behavior and, instead, cause the system to reboot. To enable watchdog in the kernel, you first need to make sure that the softdog module is compiled for your kernel. On a normal Red Hat or SuSe distribution you will not need to add watchdog to your kernel because the modular version of the Red Hat kernel contains a compiled copy of the softdog module already. But you would need to add this command to an init script so that it would be executed each time the system boots. In addition to using the softdog timer as we've just described (as part of the normal configuration of your server to improve its reliability when the system hangs) you can tell Heartbeat to update the softdog timer. This lets watchdog know that Heartbeat is running and healthy. If the timer doesn't get updated, watchdog will notice and force a kernel panic. In effect, we are telling watchdog to watch Heartbeat. With Heartbeat release 1.2.3, you can have apphbd watch Heartbeat and then let watchdog watch apphbd instead. When you enable the watchdog option in your /etc/ha.d/ha.cf file, Heartbeat will write to the /dev/watchdog file (or device) at an interval equal to the deadtime timer raised to the next second. Thus, should anything cause Heartbeat to fail to update the watchdog device, watchdog will initiate a kernel panic once the watchdog timeout period has expired (which is one minute, by default). You should do this on all of your Heartbeat servers to maintain a consistent Heartbeat configuration. Softdog: WDT device closed unexpectedly. WDT will not stop! This error warns you that the kernel will panic. Your system should reboot instead of halting if you have modified the /proc/sys/kernel/panic value as described previously. See Chapter 3 for a discussion of the Lilo boot loader. Heartbeat on the backup server should detect the loss of heartbeat packets from the primary server and initiate a failover. Using Stonith, the backup server should turn off or reset the power to the primary server. Heartbeat on the backup server should then run the proper resource scripts (when the Stonith event has "cleared" or completed) to take ownership of the resources. Heartbeat on the backup server should also send gratuitous ARP broadcasts to notify clients and/or network equipment that the MAC addresses for the resource IP addresses have changed. where 209.100.100.3 is the IP alias that fails over to the backup server. The MAC address should change automatically when the backup server sends out gratuitous ARP broadcasts. Use the hb_standby command on the primary server to force resources to failover to the backup server. Then use the command again on the backup server to force the resources back to the primary server. ipfail will not work properly if the hb_standby command is not working properly. Using ipfail (or Mon, or a similar monitoring tool), the network connection failure should be detected and the resources and IP aliases should failover to the backup server. Use more than one heartbeat path between the servers to avoid false positives (the backup server incorrectly assumes the primary server has died). When you remove only one of these paths, such as the crossover network cable or serial cable connecting them, nothing should happen. What happens when you remove all heartbeat paths between the two servers? If you are using Stonith, the backup server should assume that the primary server has died, initiate a Stonith event, and take over the resources. What happens next depends upon how you have Stonith configured and whether or not you are using the auto_failback option. With two Stonith devices (each server controlling the other server's power supply) and the auto_failback option turned on, the two servers may start repeatedly cycling each other's power or Stonithing each other. To avoid this, you can disable auto_failback or use the method described earlier in this chapter to power off rather than power cycle the primary server. Stonith is especially important when you are using IP aliases to offer resources to client computers. The backup server must Stonith or power off/reset the primary server before trying to assume ownership of the resources to avoid a split-brain condition. This case was not addressed by the Heartbeat configuration used in this chapter. Depending on your needs, you can run cl_status, included with the Heartbeat package, or cl_respawn, which is also included with the Heartbeat package, to monitor or automatically restart services when they fail. You can also use the Mon application (described in detail in Chapter 17) to monitor daemons and then take specific action (such as sending an alert to your cell phone or pager) when the service daemons fail. Do the servers boot properly and leave the resources on the primary server where they belong once both systems have finished booting? You may need to adjust the initdead time in the /etc/ha.d/ha.cf file if the backup server tries to grab the resources away from the primary server before it finishes booting. You may need to make sure the Cisco equipment accepts Gratuitous ARP broadcasts with the Cisco IOS command ip gratuitous-arps. Preventing the possibility of a split-brain condition while eliminating single points of failure in a high-availability server configuration is tricky. The goal of your high-availability server configuration should be to accomplish this with the least amount of complexity required. When you finish building your high-availability server pair you should test it thoroughly and not feel satisfied that you are ready to put it into production until you know how it will behave when something goes wrong (or to use the terminology sometimes used in the high-availability field: test your configuration for its ability to properly handle a fault, and make sure you have good fault isolation). This ends Part II. I have spent the last several chapters describing how to offer client computers access to a service or daemon on a single IP address without relying on a single server. This capability—the ability to move a resource from one server to another—is an important building block of the high-availability cluster configuration that will be the subject of Part III.